Yesterday, Hanna and I rented a zipcar and drove up to Freeport, Maine, to the L.L. Bean flagship store to purchase winter boots, long underwear, and a few other items to keep us toasty warm this winter. While we were there, Hanna found this little brown bear, made from recycled plastic bottles, who informed her he was tired of hanging around the store and wanted to come home with us. And so she bought him for me. 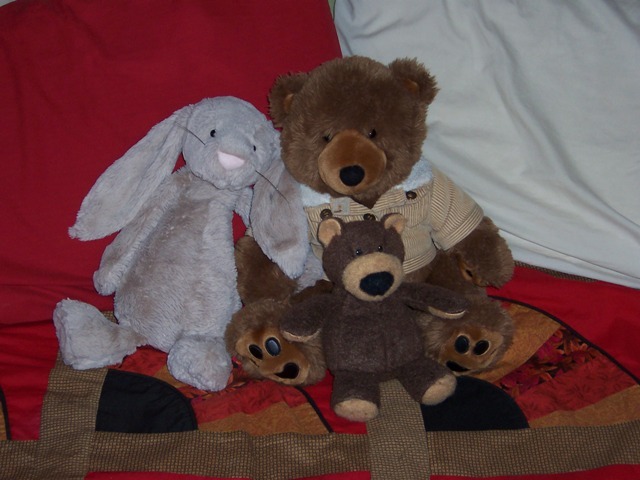 Here he is, sitting on the bed with Evangeline (the bunny rabbit) and Sebastian (the elder bear). They are getting him acquainted with the ways of our household. He has not yet been forthcoming on the matter of his name; if any of you feel inspired, feel free to chime in via comments!